So, I totally wish we had Shoney's around here right now. :((( Why? 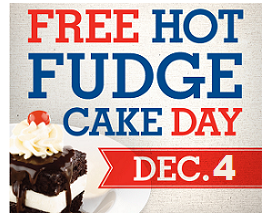 Because I LOVE Hot Fudge Cake and they are giving it away for FREE on December 4th. Oh well...for those of you who do have a Shoney's near you, stop on by on 4th for some FREE Hot Fudge Cake. National Free Hot Fudge Cake day is back! Head to your Shoney’s on December 4th for a Free Hot Fudge Cake on the house. Take a break from Holiday shopping at Shoney’s and enjoy the delicious treat America has loved for generations.